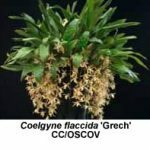 Considering its size (200 species and about 35 hybrids) the Asian genus Coelogyne is not particularly popular with Victorian orchid growers. 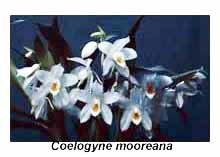 Most growers have Coelogyne cristata in their collections, and perhaps also C. mooreana, C. flaccida, C. fimbriata or C. tomentosa, all of which are suitable for a cosy shade-house. These species experience wet, warm conditions during the wet season, and cool, relatively dry conditions during the ‘dry’ season. They should be watered frequently during summer (every day or two) but much less often during winter (once every week or two). All of the above species are found at elevations above 1000 m, and consequently they may be grown under frost-free conditions in Victoria. (C. cristata is found at elevations of 1500-2600 m, C. mooreana at 1300-2000 m, C flaccida at ‘moderate altitudes’, C. fimbriata at 0-1500 m and C. tomentosa at Tow to moderate’ altitudes. 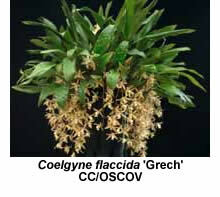 But do not imagine that all coelogyne species may be grown under the above conditions. Species like C. pandurata and C. asperata grow at much lower altitudes (<1000 m), and need tropical conditions if they are to grow and flower well. And then there are high-altitude species, such as C. corymbosa (up to 2800 m), that flourish only if they can be kept cool and damp during summer. Fortunately there are many others that are suitable for cultivation under intermediate conditions (min. temp. 10-12°C). 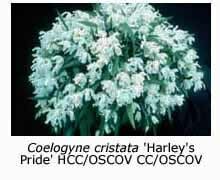 Some of those that grow and flower well for me are C. fragrans (1000-1600 m), C. flexuosa (900-1500 m), C. speciosa (700-2000 m) and C. lawrenceana (‘moderate’ elevations). 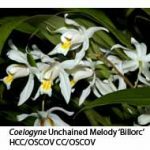 Relatively few coelogyne hybrids have been made, the most commonly grown in Melbourne being C. Unchained Melody (C. cristata x C. flaccida) and C. Linda Buckley (C. mooreana x C. cristata), which (like the parent species) may be grown without heat in Melbourne. 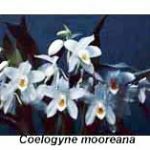 Others that I grow and recommend are C. Jannine Banks (C. mooreana x C. flaccida) and C. Memoria W. Micholitz (C. lawrenceana x C. mooreana). Others on my wish list are the recently registered C. Spring Showers (C. cristata x C. lawrenceana) and C. Memoria Louis Forget (C. speciosa x C. mooreana). Micholitz and Forget were two of Frederick Sander’s last plant collectors, both retiring from service at the onset of the First World War. 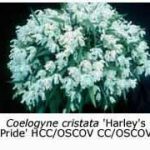 Coelogyne speciosa has been used more widely in hybridising than any other species, eleven hybrids having been registered with this species as the pod parent and seven as the pollen parent; few if any of these hybrids are available in Melbourne. Only those made with a cool-growing partner would be suitable for shade-house cultivation. 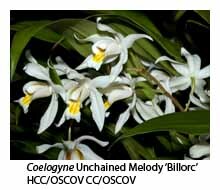 One of the oldest coelogyne hybrids is C. Burfordiense but this hybrid grows and flowers well only if grown in a heated glasshouse, as its parents are C. pandurata and C. asperata.